Exactly one week ago, I wondered if we could ever get along. Just a scant couple of days later, last Wednesday, a 66-year-old Illinois man opened fire on Republican lawmakers practicing for the annual Congressional Baseball Game, and nearly killing House Majority Whip Steve Scalise. 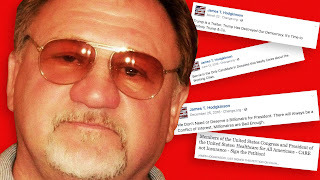 James Hodgkinson, a leftist driven by the hate of his political rivals, was killed by police returning fire, however he still also shot Two Capitol Police officers, a congressional staffer, and a lobbyist. It has been reported that investigators found a hit list of GOP lawmakers’ names on Hodgkinson’s body. What did these people do to deserve being shot? They voted in a manner and held political beliefs that this guy didn't like. That's it. This is the start. There will be more. Why am I so confident? Simple. There are those on the Left that are claiming that someone that lives a life promoting "hate" deserves what comes to him. Even if it is being shot on a baseball field.